The Archdiocese of Philadelphia has become the latest 'ground zero' of sexual abuse cover-ups inside the Catholic Church in America. The immorality and corruption being exposed through internal Church records and directives, as well as through years of criminal investigations — is beyond gruesome. The Philadelphia Inquirer, which has closely followed the events, obtained Cardinal Bevilacqua's testimony before a grand jury — shortly before a judge sealed it. The testimony has been published and is unprecedented, as a window into the mind of one of the most notorious protectors of pederasts and pedophiles, inside the Catholic Church. It is impossible to encapsulate in words the reaction to such evil — which has existed under the authority of church officials — including popes. It is also a testimony of how modernists — in other words, non-believers, have betrayed the Church. Celibacy in the Roman Catholic Church is a crowning jewel. Many men and women religious who uphold and defend their sacred vows find themselves often rejected by Church officials who are more interested in covering up sexual scandals, than embracing authentic holiness. The Roman Catholic Church does not need to change her structure. The Roman Catholic Church needs to rid herself of impostors — and their lay travelling companions. Our earliest experiences in life are essentially points of departure. As a practicing Roman Catholic and one who respects Church authority I am drawn to reflect on the events of my Catholic experience, growing up under Fidel Castro's murderous Communist regime. I was taught by my parents to defend our Catholic faith, in spite of the persecution that we suffered. But thousands of others have been imprisoned, tortured and executed — among them, members of my family — as they cried out "Long Live Christ the King!" 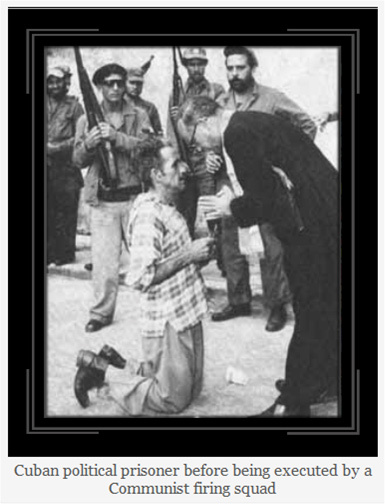 When we stood up as Catholics against the Communists in Cuba, we did so immediately and without hesitation. Our defense of the Church was based on faith and conviction. We did not stop to consider "conspiracies" from the Communist bureaucrats. Within the confines of our home I was secretly taught the Catechism by my mother — the Catechism being the authoritative expression of the Catholic faith. Our formation had to be strong, in order to fight the evil that surrounded us. We did not look for public relations maneuvers — nor did we appeal to Cardinals for help. We were Christian soldiers left in a battlefield of brutal violence and hatred against our God-given rights — and it was up to us to stand up and defend those rights. Having lost our liberty, the only source of hope was our faith and our love for Christ and his Church. The world chose to ignore our suffering. To this day, it still does. In fact, even the Holy See has increasingly betrayed and abandoned the plight of the Cuban people under Castro — through diplomatic maneuvers between Rome and Havana. Under Communism, my living example of greatness and loyalty within the Church was the priest who risked his life to make sure that I received my First Holy Communion, while armed Communist military thugs threatened us — as they lined the walls of my hometown's beautiful church, which dates back to the 17th Century. The battle cry in defense of our faith still echoes inside the walls of that church. Not enough can ever be said about the lay Catholics who never wavered in their defense of the Church — in spite of the persecution they suffered under Communism. I never knew liberty until I came to the United States. I am still exhilarated by it. But liberty did not prepare me for the realization that the Church we had defended against the Communists, was being attacked from within. And an attack on the Church is a universal act that cannot be nuanced — even more so when the perpetrator of the attack is a Cardinal himself. I had never seen a Cardinal growing up under Communism — given Castro's repressive activities against the Church. In the United States, my most vivid archdiocesan experience was under a modernist, Roger Cardinal Mahony — and one I would rather forget. With his progressive exhortations and innovative social experiments, Cardinal Mahony managed to destroy the Archdiocese of Los Angeles — both morally and financially. Under Mahony's reign, Los Angeles witnessed one of the city's darkest periods, as victims of clerical sexual abuse began to step forward. What is Cardinal Mahony's legacy? Abusive priests from the Archdiocese of Los Angeles still live unmonitored across the nation. (PDF). Under Communism we at least knew who the enemy was — but in the Catholic Church, the enemy is hiding. Catholic Church officials have run out of excuses. 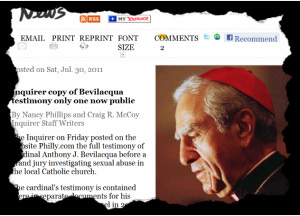 The recently published testimony of the infamous Cardinal Bevilacqua, before a grand jury, puts to rest any notions that there is an external "conspiracy" — as more and more victims come forward, exposing how Church officials have covered up the sexual abuse of children in the Church. If there is a "conspiracy" — it is internal — and it is hidden under the breath and whispers of certain members of the Roman Curia. Cardinal Bevilacqua's role in the cover-up of the sexual abuse of children is a betrayal of the Church — which includes the faithful Catholics who gave up their lives in her defense. 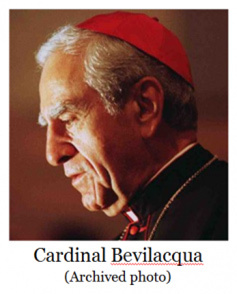 What made Bevilacqua even more dangerous is that he isn't just a Cardinal. Cardinal Bevilacqua is a canon lawyer — as well as a civil lawyer admitted to practice before the Courts of New York State, the Courts of the State of Pennsylvania and the U.S. Supreme Court. This is the ultimate insult to injury — considering Cardinal Bevilacqua's background as a lawyer, and his understanding of the criminal implications of covering up and protecting dangerous sexual predators. Bevilacqua's history of cover-ups is not limited to Pennsylvania. Memos reveal that during Bevilacqua's tenure as Auxiliary Bishop at the Diocese of Brooklyn, he covered up and transferred an extremely dangerous predator, Father Romano J. Ferraro, who is now serving a life sentence. While this was happening, Cardinal Bevilacqua was also working closely with both Pope John Paul II and Benedict XVI. As recently as February 28, 2011, Cardinal Bevilacqua was listed as Chairman of The Papal Foundation — the Pope's biggest monetary fund — an extremely powerful multi-million dollar American foundation which is managed by Benedict XVI. A minimum $1 million dollar donation is required to become a steward. 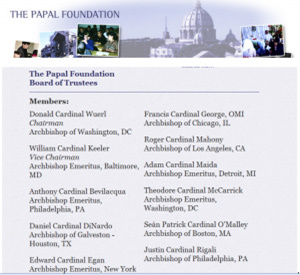 A screen caption taken on July 30, 2011 of the Papal Foundation's website now shows Bevilacqua as a "member" of the board of trustees — with Cardinal Wuerl, from Washington DC, having been moved up to the position of Chairman. But the Holy See is not the only place where the red carpet has been rolled out for Cardinal Bevilacqua, as a "prince of the Church." Wealthy lay Catholics for years have also been rolling out their own red carpets for Cardinal Bevilacqua — even after a grand jury report had been issued, describing his involvement in covering up the sexual abuse of children — during his tenure as Archbishop of Philadelphia. Is it that these wealthy lay Catholics — with their teams of powerful lawyers, simply ignore or do not care about such significant legal public records detailing the cover-up of the sexual abuse of children in the Catholic Church? Is this part of the "this-is just-a-conspiracy- against-Catholics" approach to defending the Church? Or is there a motivation for power, greed and control behind their actions — while they hold meetings — sometimes at luxury resorts and hotels — to raise money in "defense" of human dignity and human life — in the company and under the oversight of impostors like Bevilacqua? And I say impostors — because Cardinal Bevilacqua did not operate alone. It is prudent that faithful, well-intentioned Catholics, question and investigate the background of lay Catholic organizations and movements — before lending their names, or giving their time and money — or they may find themselves seated next to another Cardinal Bevilacqua — amidst luxury, pomp and circumstance. But questioning the rich and powerful requires courage — and can be time consuming. So most people prefer to give in to that fancy luncheon — where they can feel good about themselves, while millions of dollars are raised and channeled in different directions — all in the name of "working for the Church." But are they — really? It is of serious concern, and very disturbing, that someone like Bevilacqua is allowed to hold the purse strings at The Papal Foundation — in the management of millions of dollars. In contrast, Jesus, who lived and walked amongst the poor was able to influence and change the course of humanity, without a cent in his pocket. Fortunately, there are courageous Catholics and organizations that continue to work in defense of human life and the family — without compromising their work. It is a worthwhile effort to seek them out. It appears that Bevilacqua was very much in demand. 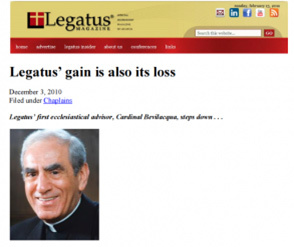 Cardinal Bevilacqua served as Tom Monaghan's "invaluable" Ecclesiastical Advisor in Legatus, almost from its inception, in approximately 1988, until December, 2010. Tom Monaghan is the former pizza king-turned-Chancellor of Ave Maria University. Legatus is Tom Monaghan's Catholic rich men's club which claims "to study, live and spread the Faith in [their] business, professional and personal lives." Legatus has chapters in many cities. "This report contains the findings of the Grand Jury: how dozens of priests sexually abused hundreds of children; how Philadelphia Archdiocese officials — including Cardinal Bevilacqua and Cardinal Krol — excused and enabled the abuse..."
Upon reflecting on Tom Monaghan's Legatus and its advertised mission "to study, live and spread the Faith in [their] business, professional and personal lives" — it is interesting to note that Mr. Monaghan has erected a building on his Ave Maria University, Florida campus bearing the name of a billionaire who has given millions of dollars to extreme-left wing, pro-choice, NARAL-endorsed politicians — including Barack Obama. Why? In exchange for a $4 million donation to the university. "Grand jury transcripts are rarely made public" — wrote the team of journalists that has been following the Archdiocese of Philadelphia sexual abuse scandals at the Philadelphia Inquirer — adding that Bevilacqua's testimony would be of interest and help on an international basis — since these scandals are not limited to the United States. The Catholic Church in Ireland collapsed under the weight of corruption, homosexual activity and the sexual abuse of children. Investigations and lawsuits are taking place in other countries, including Germany and Belgium. A lawyer who has represented victims of sexual abuse referred to the prosecutor's release of Bevilacqua's testimony as "extraordinary and unprecedented." Read Bevilacqua's testimony... and weep. CLICK on the following LINK to access the testimony through the Philadelphia Inquirer website. It is also available at BishopAccountability.org in detailed searchable format.